5) leaving the mixture to fertilise spontaneously in an incubator. 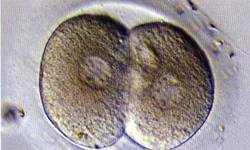 After embryo culture lasting 2 to 5 days, a limited number of embryos are placed into the uterus in accordance with legal provisions. IVF is used in the treatment of tubal obstructions, endometriosis, moderate sperm deficiency and idiopathic and immunological sterility. 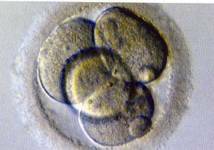 The success rate can be expressed in various ways and depends above all on the age of the woman and the number of embryos replaced. Overall, for a case under the age of 36 and with a single embryo (legal stipulation during the first two cycles at least), the rate of delivery is around 20% per cycle, which is approximately identical to the success rate for a couple of the same age who do not have any difficulties reproducing. In less than 2/100 of cycles stimulated: ovarian hyperstimulation resulting in swelling of the abdomen (which fills with liquid), which, in rare cases, requires hospitalisation for several days with punctuation extraction and an infusion to restore the altered hydromineral balance. In less than 2/1000 cases: oocyte puncture which causes an old infection of the tubes to flare up again requiring treatment with antibiotics and hospitalisation for several days. And also very rarely (1/1000), IVF can lead to delayed bleeding from the various follicles punctured. Children born through IVF have a frequency rate of congenital malformation or chromosome alteration equal to the normal rate, i.e. approximately 2/100. The highest risk linked with IVF was previously twin pregnancy (20% of pregnancies until 2003) and triplet pregnancy (previously 2% of pregnancies); under current provisions (transfer of a single embryo for young women) these risks are reduced to approximately 10% and 0.2% respectively.